In wake of the new Star Wars franchise, a plethora of merchandise is being released on a global level. 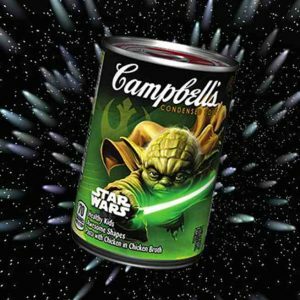 In this line of Star Wars themed merchandise is… Star Wars themed Campbell’s soup. The significance of the extent to which Star Wars now reaches, is the fact that story is no longer experienced in the movie theater alone. Audiences now immerse themselves in story even when they aren’t reading the book, or watching the film. Read a brilliant analysis of Joseph Campbell and the commercialization of story here.